A happy Bend-ite sledding at Wanoga Sno-Park. The 2014 Sochi Olympics are upon us, and we’re excited to cheer on our two Olympic athletes from Bend: alpine skier Laurenne Ross and halfpipe snowboarder Kent Callister. But why just watch when you can get in on the action, too? We’ve compiled a list of our own Bend Olympics 2014. It has all the events, just without the weird toilets and questionable drinking water. 1. 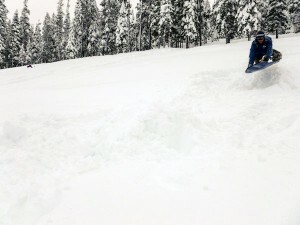 The snow gods have answered our prayers and our mountain is getting dumped on! So start out your Bend Olympics at Mt. Bachelor with downhill skiing, snowboarding, and Nordic skiing. Many real Olympic athletes have trained here. Why not you? 3. Want to get a taste of luge, skeleton or bobsledding? Wanoga Sno-Park has the hill and the snow, as well as a cozy warming hut and a fire ring for your Olympic torch. All you need to do is bring a sled, toboggan, saucer, innertube or air mattress and develop your own course. Hey, that’s how the Jamaicans got started. 4. If you have a cast-iron tea kettle lying around the house, take your broom to the pond and try some curling. For that matter, an icy and empty parking lot will do. 5. Three things you can do in Bend that you won’t see in Sochi: snowshoeing (almost anywhere that there is snow), skijoring (skiing powered by your dog), and snowmobiling. 6. Create your own snowman-building contest or have an epic snowball fight. You may not feel like an Olympic champion. But at least you’ll feel like a kid. 7. Finally, for your closing ceremonies, drop by Winterfest at The Old Mill, February 14-16. It’s a huge party with live music, an international variety of foods to sample, and of course, the brilliant ice sculptures. Sochi may be hosting all the world-class athletes, but we’ve got a world-class outdoor playground right in our backyard. Comment and tell us how your Bend Olympics 2014 goes. Til next time, dosvedonya!